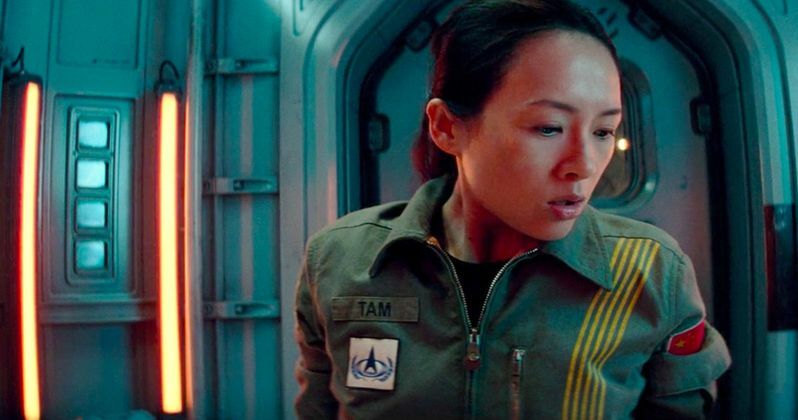 Zhang Ziyi is seen working in a giant water tank during one of the thriller's most climactic moments. It was a challenge to shoot, and it also required a lot of exercise. The actress had this to say about her time spent on set. "I have never acted in this type of film before. I was very curious about it. I have some intense underwater scenes. Two days of shooting in a small tank. It was tough because you have to carry weights in the water. You have to do a lot of stuff in the water. For me it was kind of like exorcise. It was also unique to see. When Julius asked me to come and join the fun, he said 'You will be kickass.' I said, 'Yes, I will do it.'" The Blu-ray bonus features will include "Things Are Not as They Appear: The Making of The Cloverfield Paradox", which contains the exclusive footage we have here, direct from Paramount Pictures. Also included is "Shepard Team: The Cast", which looks at the ensemble of international actors that have been lined up for this thriller. The video comes from Paramount Home Entertainment.